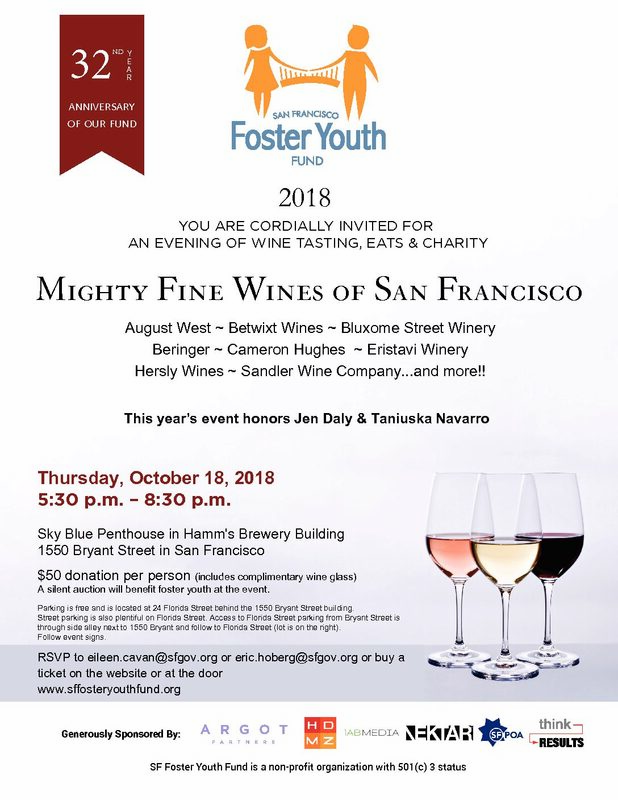 Don’t miss this year’s San Francisco Foster Youth Fund wine tasting event. Invite your friends and colleagues to eat, drink and be merry while supporting foster youth at the same time. This year’s honorees will be PSW Taniuska Navarro and Legal Services for Children attorney Jennifer Daly, two extraordinary advocates for foster youth. All of our wineries from last year will be back, including August West Wine, Bluxome Street Winery, Sandler Wine Co., Hersly Wine, Cameron Hughes, Betwixt and Beringer. Our event will also feature a silent auction with fantastic donated items, including wine country trips, sports memorabilia, jewelry, artwork, event and restaurant gift certificates, and Warriors tickets. Parking is free and is located at 24 Florida Street behind the 1550 Bryant Street building. Access to Florida Street parking from Bryant Street is through side alley next to 1550 Bryant and follow to Florida Street (lot is on the right). See map here: Hamms Brewery Map. It is not advised to park on Bryant street due to car break ins nor to park in the Potrero shopping center lot as they ticket and tow cars who are not customers. Tickets can be purchased at the door with a $50 donation to SF Foster Youth Fund. You can also make a $50 donation online right now to reserve your spot. Simply enter “Mighty Fine Wines Ticket” in the comment field when you make your donation.